The first siren series of Kazoku and Siren was first released on Super Nintendo in December 1995. Every time she enters the dungeon of adventure, it appears as the second strange dungeon following the "big adventure of Toruneko" that set out a new genre called "epoch-making dungeon RPG" whose topography changes randomly. In the Japanese style of the world view "the third shrimp", the hero 's hero named "Taga sappa". It is a masterpiece that brought out a lot of fans to the innovative setting that RPG of the time did not overcome the user. Thereafter, in November 1996, the series 2nd game Gameboy software "Monster Sakurai GB Monster of Month Village" was released. In 1999, "Monster of Kaze no Siren GB Monza Village" released at Game Boy was released on Windows 95/98 edition. This work was not merely a transplant, but "Fay's final problem self-made kit" was added, and it was a work supported by a high age group. And last year, in the 64th edition of Nintendo "Siren 2 Demonic Invader of the Wind! Shiren Castle!" was released. This is a story that Siren talked about early childhood, protecting the villagers attacked by demons by making a castle. Dive into the dungeon and take home what is to be the material of the castle. Works that this novel system became a topic. In this way, after four works, this work "Siren Girls of the Wind" GB 2 ~ Desert Magic Castle ~" was released. In 2002, an Internet-ready version was released that gained popularity as a rogue RPG. By responding to the Internet, you can ask friends for relief if you compete with other users on a ranking page "Internet ranking" etc. set up on the official website, or you exhausted with a specific dungeon as it has become (I mean the character rescue in the network!). 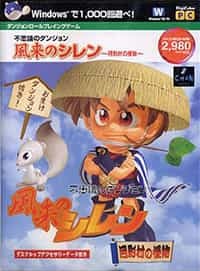 In addition, it is a title full of gimmicks like "to play semi - permanently", as rare items are given to the top scorers. In addition to the main body of Siren: Internet version, the package version announced this time includes a communication tool "Mononoke Plaza - Kazoku no Shiren Community Door ~". By the way, when using the pictorial square, you can: chat between registered users of Siren; 8 chains of monsters appearing in Siren, chosen players' alter ego. You can express your emotions by flying or bouncing. (Monsters, Nigiri, Monke, Timara, Pakolepkin, Nutsuto, Boyya, Gamara); Receive notice of the events etc; You can purchase a room and folding screens that you can make "My Room" , have your own room, you can decorate (the kind of furniture will be increased in the future); Using your neighborhood map, you can go to friends 'houses'; You can enjoy mini games with original card game. Actually, as "community software", this "SQUARE SQUARE" will be the first in the Siren series. For this work already already completed as rogue system, this packaged version with a lot of added value wishes to recommend to beginners of wonder dungeon series.